Literary Loch Lomond and the Trossachs: 6. Upper Loch Lomond and Glen Falloch. Wherever we stopped, somewhere within sight a foaming cataract traced its descending thread or narrow ribbon, chalk-white or shining silver according to the shade or sun, down the steep plunge to the opposite shore. By the time we turned away towards Inveraray – not far from the place where Wordsworth stood while ‘The Solitary Reaper’ sang her plaintive song perhaps .. . for old, unhappy, far-off things, and battles long ago we had counted 25 waterfalls. IN this tour, my wife and her sister Sara were my companions. The account of the “Brownie’s Cell” and the Brownies was given me by a man we met with on the banks of Loch Lomond, a little above Tarbert, and in front of a huge mass of rock, by the side of which, we were told, preachings were often held in the open air. The place is quite a solitude, and the surrounding scenery very striking. How much is it to be regretted that, instead of writing such Poems as the “Holy Fair” and others, in which the religious observances of his country are treated with so much levity, and too often with indecency, Burns had not employed his genius in describing religion under the serious and affecting aspects it must so frequently take. Shot lightning through this lonely Isle! How loud! yet lived in peace with shame. Upon a small island, not far from the head of Loch Lomond, are some remains of an ancient building, which was for several years the abode of a solitary Individual, one of the last survivors of the clan of Macfarlane, once powerful in that neighbourhood. Passing along the shore opposite this island in the year 1814, the Author learned these particulars, and that this person then living there had acquired the appellation of “The Brownie.” See “The Brownie’s Cell,” to which the following is a sequel. Inverarnan, which lies on the bank of the Falloch, consists of only a few houses and the old hotel, which, during the construction of the [railway] line, was turned into houses, the principal [house] being a residence for the engineers engaged The steamers on Loch Lomond used to come up to Inverarnan, before the pier at Ardlui was built, and the hotel was the old posting establishment. Beside it can be seen the little artificial basin where the vessels lay. From Inverarnan coaches used to run all the way to Fort William, Oban, and Ballachulish. At the upper end of Loch Lomond steamers are able to penetrate a short way inland, as the river Falloch broadens into a sort of canal before losing itself in the waters of the lake; and the little saloon steamers thread their way up this as far as Inverarnan, where they come to an anchorage at a rustic pier beneath a huge, wide-spreading elm. When we saw the steam arising from this secluded spot (which we could do from the windows of Glenfalloch House), we knew the boat was there, and ten minutes’ walk would take us to it. Half-way was the boundary between Dumbartonshire and Argyllshire, with a turnpike-gate on the edge of either county. Thus there were two turnpikes within a hundred yards of each other – a queer state of things, which has since passed away. There being no West Highland Railway at the period, coaches from the north were the only means of conveying tourists and other passengers from Dalmally and Tyndrum to Loch Lomond, Loch Katrine, and the far-famed Pass of the Trossachs; so that every afternoon coaches came in rapid succession, galloping, rocking, and swaying, down the glen. There were dangerous corners to be turned; but of course the bulk of the coach-load did not know this, and were innocently happy as they spun past, though we, who soon grew familiar with every inch of the road, were well pleased when they disappeared among the trees on the plain below. The most easy rising, for a short way at first, was near a naked rivulet which made a fine cascade in one place. Afterwards the ascent was very laborious being frequently almost perpendicular. Higher up we sat down and heard, as if from the heart of the earth, the sound of torrents ascending out of the long hollow glen. To the eye all was motionless, a perfect stillness. The noise of waters did not appear to come from any particular quarter; it was everywhere, almost, one might say, as if ‘exhaled’ through the whole surface of the green earth. Glen Falloch, Coleridge has since told me, signifies the hidden vale; but William says that if we were to name it from our recollections of that time we should call it the Vale of Awful Sound. 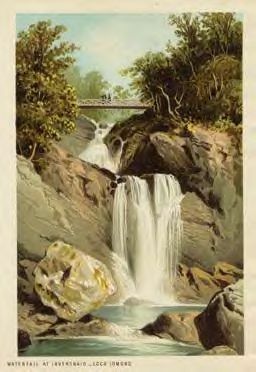 Dorothy Wordsworth calls Glen Falloch ‘the Vale of Awful Sound’, because of its waterfalls. At the Falls of Falloch the plunge pool is named ‘Rob Roy’s Bathtub’, and a small cleft above it is called ‘Rob Roy’s Soapdish’. The falls impressed Coleridge as he walked north towards Glen Coe and Fort William after parting with the Wordsworths. . They can be reached from a car park on the right of the road going north. On our way home we visited the Falls of Falloch, which were in full spate and a sight worth seeing. Above the topmost fall was a long narrow gorge through which the congested waters dashed foaming to leap with a thunderous roar into a rock cauldron. At one point the gorge was narrow enough to challenge one’s sporting instinct. Was a leap possible? We measured it up. It would have to be a standing jump from spray-drenched rock…. One by one we jumped safely. The gut was narrower than it looked. We had been too impressed with the fury of the water. Thus I was just a trifle less careful in making the return jump; my foot slipped off the wet rock and down I went into the gorge. He was swept over the falls and found it impossible to escape from the whirlpool at their foot. Nearing exhaustion he was finally carried out of the cauldron by an undercurrent. Murray is also one of the best biographers of Rob Roy, and writes well about district as a whole. With the deep-voiced rush of sound that shakes a city. And wet black walls of rock shut in the scene. Lifting with leaping water out from the rock. Where light’s bright spark dives to the dark’s controlling. Force without spending, form without fetter of shape. Where drifted spume clings with a soft adhesion. After climbing through Glen Falloch the road levels off, reaching a plateau which, was, in the words of John Thomas (1914-1982), the distinguished railway historian, and author of The West Highland Railway , ‘to become known to generations of West Highland footplatemen as ‘the fireman’s rest’. After a gentle descent, the village of Crianlarich is reached. That vast and awful depth of hills). Rogers was, in his day, a highly regarded poet, who visited Scotland on several occasions. 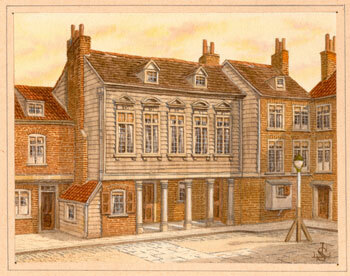 In 1803 his visit coincided with that of the Wordsworths. Jeffrey praised his work. Rogers, like other authors relied on publishers. However, when his poems did not sell well he produced a lavish edition of them himself, and persuaded Turner to illustrate it. The famous ben at the head of Loch Long is, alternatively, and evocatively, called Ben Arthur. One of the sons of Aeden Mac Gabhran, a king of the Scots of Dalriada was called ‘Artur’, and it is sometimes argued that he formed a basis for the legendary monarch. 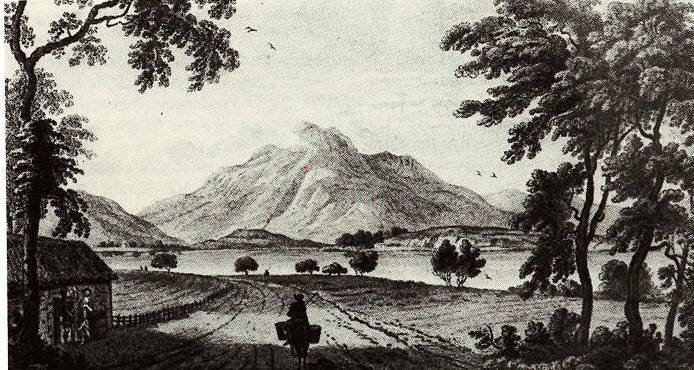 Coleridge, writing to his wife in September 1803, related how he went ‘ to Arrochar, on purpose to see the Cobbler, which had impressed me so much in Mr Wilkinson’s drawings…’ It was Wilkinson’s Tour which in part persuaded him and the Wordsworths to visit Scotland. Writing from Arrochar, Burns probably had the Cobbler in mind when he referred to his sojourn in ‘a land of savage hills, swept by savage rains, peopled by savage sheep, tended by savage people.’ However, Turner, and others, thought it sublime. Neil Munro made Arrochar one of two possible birthplaces of the skipper of the Vital Spark, and the setting for the famous story Mudges, giving the place a reputation of another sort. Argyll’s Bowling Green! How did such a piece of knobbly country, rugged even by Wester Ross standards, get such an undescriptive name? It was nothing to do with some early duke’s sense of humour, merely the corruption of a Gaelic name Buaile na Greine, which means the sunny cattle fold, a place where the dukes and duchesses used to rest their horses on Loch Longside after crossing from Lochgoilhead. And rough as that peninsula is, it was much traversed by cattle drovers coming from Loch Fyne by Hell’s Glen to skirt Loch Goil, cross the ridge to Loch Long, and ferry their cattle across to Portincaple. At the top of the hill we came to a seat with the well-known inscription “Rest and be thankful” On the same stone it was recorded that the road had been made by Col. Wade’s regiment. The seat is placed so as to command a full view of the valley, and the long, long, road, which, with the fact recorded, and the exhortation, makes it an affecting resting-place. … a bleak and dreary region, now made easily passable by a military road, which rises from either end of the glen by an acclivity not dangerously steep, but sufficiently laborious. In the middle, at the top of the hill, is a seat with the inscription “Rest, and be thankful.” Stones were placed to mark the distance, which the inhabitants have taken away, resolved, they said, to have no new miles. I soon found a contrast to the delightful scenes we left. They were succeeded by deserts and dismal heaths. We entered a narrow pass between two chains of high mountains, which appear to have, at a very remote period, formed only one ridge, but which some terrible revolution has torn asunder throughout its length. This defile is so narrow, and the mountains are so high and steep, that the rays of the sun can scarcely reach the place and be seen for the space of an hour in the twenty-four. For more than ten miles, which is the length of this pass, there is neither house nor cottage, nor living creature except a few fishes in a small lake, about half way. 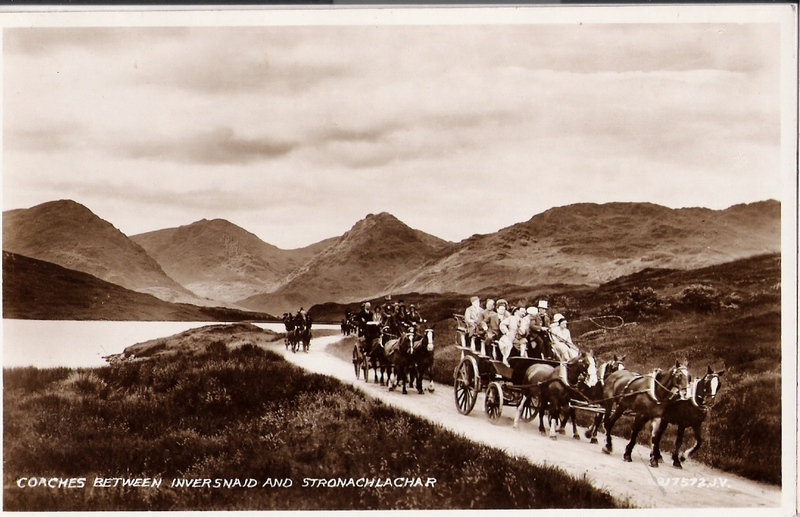 The carriage road…turns to the right, up one of the most formidable as well as most gloomy passes in the Highlands, amongst such black, bare, craggy, tremendous mountains, as must shake the nerves of every timorous person, particularly if it be a rainy day. And when is there a day in the year free from rain in Glen Croe? and on the hill called “Rest-and-be-Thankful?” no day; no not one! The day was perfect for that glorious stage from Cairndow to Tarbet. Few things are more magnificent than the rise from Cairndow to Rest-and-be-Thankful. The top of it, where the rocky mountain rises above the little solitary Loch Restil, and all the adjoining peaks are brought into view, is singularly fine. As I stood at the height of the road and gazed down on its strange course both ways, I could not help rejoicing that there was at least one place where railways, and canals, and steamers, and all these devices for sinking hills and, raising valleys, and introducing man and levels, and destroying solitude and nature, would for ever be set at defiance. It was not until we had passed from Loch Long into Loch Goil that the true Highland scenery began to open upon us in its surpassing loveliness and naked grandeur. The shores of Loch Goil are rough, barren, and precipitous, but now and then we passed green-sheltered nooks and dark glens of indescribable beauty. I grew more and more silent and unconscious of my immediate surroundings, for my very soul seemed to have gone from me, to revel abroad in the wide, varied, enchanting scene. 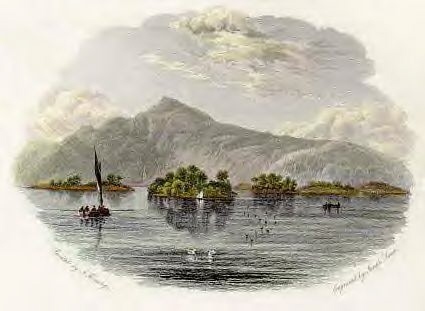 Whether this is the scene described in the ballad of “Lord Ullin’s Daughter” is open to question, as that “dark and stormy water” lies a long way off, west of Mull, with “Ulva’s Isle” adjoining, though, strictly speaking, the name is Loch-na-Keal and not Loch Goil; and our Loch Goil may well be the point intended by the poet, because three days from the mainland opposite Mull, would bring “her father’s men” to it. Another Campbell poem sometimes attributed in guide books to Carrick Castle on Loch Goil is Lines on Visiting a Scene in Argyllshire , but it is almost certainly about Kirnan, near Kilmichael Glassary, where Campbell’s family came from. Bill [W. H.] Murray (1913–1996) lived near Carrick Castle for many years . One of the best, and one of the most affectionate, books about the West Highlands is his Companion Guide to the West Highlands of Scotland . His mountaineering books, about both the Himalayas and the Highlands are entertaining and authoritative. He was also a novelist, and his biography of Rob Roy is important. In his Companion Guide he maintained that Loch Goil, ‘the only truly mountainous fiord of Argyll’ is the most beautiful sea loch of Cowal or the Clyde Coast. From Lochgoilhead it is worthwhile travelling through Hell’s Glen [B839] to join the A815. Strachur is a small resort where there is a Smiddy Museum. Strachur House was in recent years the residence of the writer of one of the most distinctive books about the Second World War, Eastern Approaches  by Sir Fitzroy Maclean (1911-1996), partly about his work with the Partisans in Yugoslavia. A diplomat, then an MP and a Minister, he is also the author of various serious, and other popular historical works. From Strachur the A815 crosses to Loch Eck. From Whistlefield a lesser road [signposted Ardentinny] leads to Glen Finart. And Her – the Lady of the Glen. The house is very small and neat, in a narrow rocky glen running up among steep mountains, with its small river, and a beautiful beech grove between it and the lake. A ferry is within sight of the windows; and while we sit at dinner, we see the little boat passing and repassing continually. At the ferry house is kept also a packet-boat, which twice a week sails to Greenock with passengers, and takes and brings back our letters, and brings back grapes and peaches from the gardens at Dunmore….
. . . sublime, mountain behind mountain receding one behind another, on each side of the lake, till the vista terminates in a point, and these clad in the softest and richest colours that mist and sunshine can give them. Indeed, I think in its way it surpasses everything of the kind we ever saw together. 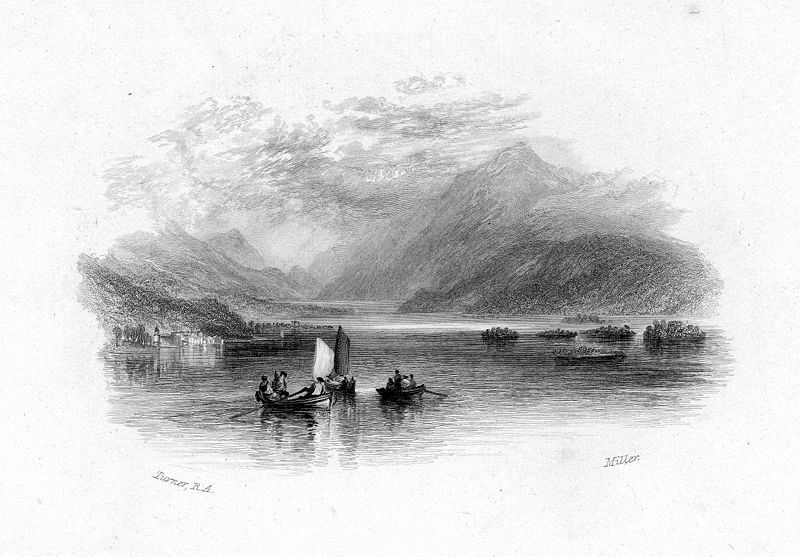 Turner’s illustrations for Roger’s Poems included one of Loch Long. As with some of Tannahill’s other topographical lyrics the evidence that there ever was such a lass in his life is uncertain. Blairmore was the residence, after his retirement, of John Joy Bell (1871-1934), the journalist and author of the Glasgow equivalent of ‘Just William’, Wee Macgreegor. One of Bell’s between-the-wars travel books about the west coast, Scotland’s Rainbow West was very popular indeed between the wars. From Blairmore visitors returning to Loch Lomond will probably find it most convenient to continue via Kilmun to the Dunoon road [A815], and thence by the Younger Botanic Garden to Loch Eck and Strachur. Beyond Ross Dhu, at Camstradden, is the most intimate part of Loch Lomond. There are several large islands in the loch which partly close the view and give Loch Lomond the feel of a much smaller lake. It is no wonder that Dorothy Wordsworth found the place highly appealing. On one of the islands was ripe corn; last week in the shire of Ayr we saw oats that had not yet arrived in the ear. Passed a female who was reaping alone: she sung in Erse as she bended over her sickle; the sweetest human voice I ever heard: her strains were tenderly melancholy, and felt delicious, long after they were heard no more. The Tour of Dr Prosody, the satirical poem by William Combe (1742–1823), takes his characters to the same place, an episode illustrated by a well known ‘Rowlandson’ drawing. We had not climbed far before we were stopped by a sudden burst of prospect, so singular and beautiful that it was like a flash of images from another world. We stood with our backs to the hill of the island, which we were ascending, and which shut out Ben Lomond entirely, and all the upper part of the lake, and we looked towards the foot of the lake, scattered over with islands without beginning and without end. The sun shone, and the distant hills were visible, some through sunny mists, others in gloom with patches of sunshine; the lake was lost under the low and distant hills, and the islands lost in the lake, which was all in motion with travelling fields of light, or dark shadows under rainy clouds. There are many hills, but no commanding eminence at a distance to confine the prospect, so that the land seemed endless as the water. . . . Wherever we looked, it was a delightful feeling that there was something beyond. Meanwhile, the sense of quiet was never lost sight of; the little peaceful lakes among the islands might make you forget that the great water, Loch Lomond, was so near; and yet are more beautiful, because you know that it is so. . . .
Thomas Garnett (1766–1802), was born in Westmorland and practised as a doctor in Harrogate where his interest in Chemistry led him to became an expert on mineral waters. He was eventually appointed to a professorship of natural philosophy at Anderson’s Institution, Glasgow, a predecessor of the University of Strathclyde. He published Observations on a Tour through the Highlands and Part of the Western Isles of Scotland. which is one of the more entertaining and informative of several books of the same sort published at about that time. There is some evidence that Dorothy Wordsworth read it. in morphean air like goldfish in a bowl. mediaeval treatise on the slumbering soul. that will not court her but read shadowy books. with bees and water and the ghosts of psalms. The village of Luss and the islands nearby were used as the setting of Goblin Island . This was the first novel by Elsie Jeanette Dunkerley, [pseud. 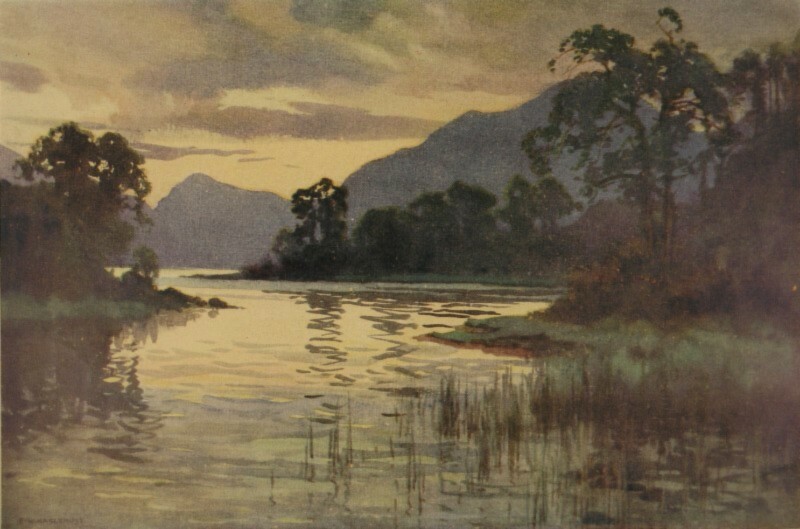 Elsie Oxenham] (1880–1960), in what became a so-called Scottish sequence of children’s stories Loch Lomond itself appears as Loch Avie. Luss also appears as ‘Markinch’ in the short story The Provost’s Tale  , byA. J. Cronin(1896-1981) and elsewhere in his work. Cronin was a world famous novelist, born in Cardross, whose best known work was Hatter’s Castle .A collection of short stories, Adventures of a Black Bag (1969), was made into the immensely popular radio and television series Dr Finlay’s Casebook. On our return to Luss we dined with our amiable and learned friend Dr Stuart who accompanied us after dinner to Strone Hill, just above the village whence we had a delightful view of the lake and its islands. The evening was fine, the lake still and a pleasing serenity pervaded the whole scene. Below us was the villageof Luss, almost hid in trees with its verdant points projecting into the lake. Inch Tavannach and most of the other islands are seen to great advantage and in the distance are part of the Grampian Mountains, which form a very fine background. The obelisk erected to the memory of Buchanan may likewise be seen distinctly. Strone Hill, or Stronbrae, is above the glen road (which is now reached by car from the by-pass, or by a footbridge from the village) just outside Luss. The road to Tarbet is superb. It is on the very verge of the lake – hard, level, rocky, with low stone bridges constantly flung across it, and fringed with birch trees, just then budding into spring, behind which, as through a slight veil you saw the huge shadowy form of Ben Lomond. It lifts its enormous, but graceful bulk direct from the edge of the water without any projecting lowlands….. Loch Lomond comes on you by degrees as you advance, unfolding then withdrawing its conscious beauties like an accomplished coquet. “The road runs sometimes through woods, at others is exposed and naked; in some so steep as to require the support of a wall; the whole the work of the soldiery: blessed exchange of instruments of destruction for those that give safety to the traveller, and a polish to the once inaccessible native. The banks of Loch Lomond are clothed by deciduous woods. Oak, beech, chestnut, larch, and birch predominate. Caledonian pine and most other coniferous evergreens are present but not much in evidence. Loch Lomond thus appears most colowful in spring and autumn when leaf is either bursting or dying. One of the more enthralling sights of June is the bluebell wood north of Luss, or in May the azaleas and rhododendrons brightening cottage gardens, and in autumn dead bracken, sun-stricken on the hillsides and blazing like a Viking’s pyre. These woods of Loch Lomondside are becoming more highly prized as the work of the Forestry Commission, whose appetite for ground is insatiable, spreads a coniferous monotony across the face of Scotland, for broad-leaved trees and hardwoods are not a rewarding crop. That the banks of Loch Lomond have remained so long free from the forester’s axe and from impairment by tourist development appears well-nigh mira­culous. Their preservation has been due to the rule of enlightened landowners, principally the Colquhouns of Luss, who have sacrificed personal profit. Geoffrey of Monmouth, the monkish chronicler who died in 1154, in his fantastic account of King Arthur, describes how that king pursued his enemies up Loch Lomond, besieged, and all but exterminated them on the islands, and overthrew an Irish army which came to their relief. The earlier historian, Nennius, from whom Geoffrey seems to have got his facts, merely states that Arthur fought certain of his battles in Glen Douglas, and this Glen Douglas is identified by Skene in his Celtic Scotland with the high pass which comes over from Loch Long, and descends at the little inn of Inverbeg between Luss and Tarbet. lay easy with obsolescent new submarines. 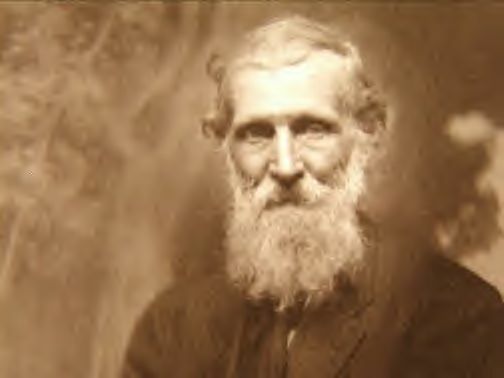 Buchan was a poet who was also the part author of the revolutionary Great Northern Welly Boot Show . Glen Douglas climbs relatively gently from Loch Lomond before the road descends very precipitously indeed to Loch Long. There it joins the road from Helensburgh and makes an interesting route to Arrochar. Tradition says he sheltered in the fastness there known as Rob Roy’s Cave. The enemy was behind, and the loch lay deep in front- No means of escape appeared till James of Douglas discovered “ane litil boat that wad but thresome flit”. In that little boat the king was ferried across, and all his host after him. While the passage was being made, Bruce entertained and heartened his men by reciting to them one of the romances which were the chief literature of that time. That mycht thaim our the water ber. To meyt thar fayis that spred war wyd. Mycht our the watter but a thresum flyt. And on his bak ber a fardele. Thai brocht thaim our and all thar thing. At the lochside close to Stuckgowan is Edendarroch, the subject of an extended paean of praise from Professor J.M.Blackie. The superb Loch Lomond, the fine sunlight that gilded its waters, the silvery rocks that skirted its shores, the flowery and verdant mosses, the black oxen, the white sheep, the shepherds beneath the pines, the perfume of the tea poured into cups that had been given by kindness, and received with gratitude, will never be effaced from my memory, and make me cherish the desire not to die before again seeing Tarbet. I shall often dream of Tarbet . . .